The UNITEC group, which specializes in the design and production of high-performance and innovative technologies for processing and classifying the quality of fresh fruits and vegetables, is present in Hall 4.1, stand A-02/05. The show is an opportunity for UNITEC to present and launch on the international market the last border in terms of classification of blueberry quality, fully developed in its Research & Development department: Blueberry Vision 3 technology, updated latest generation of Blueberry Vision 2 technology. After the extraordinary results achieved by the Fruit & Vegetables plants thanks to Blueberry Vision 2, the Blueberry Vision 3 technology launched now can lead to a new deep evolution of the global blueberry market Blueberry Vision 3 combines maximum reliability and precision in the classification of quality with unprecedented productivity growth. But the innovations presented do not stop there and also include UNIQ Apples, UNIQ Kiwi and UNIQ Plum, systems for the ranking of the internal quality of apples, kiwis and plums. As well as UNI MANAGER DATES, the Unisorting electronic grader equipped with the latest technological update of Dates Sort 3, able to visualize 100% of the surface of each date, in order to guarantee a maximum reliability and a precision in the classification of these fruits. Fruit Logistica 2019 is also an opportunity to take stock of the first year of Cherry Vision 3.0 technologies for the ranking of the quality of cherries and Pears Sort 3 for the ranking of the quality of the pears respectively exhibited at the UNITEC stand and Unisorting. 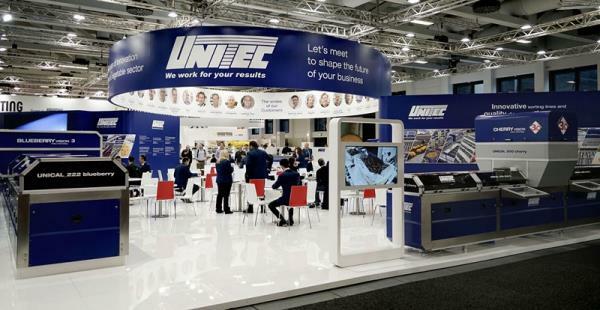 A very important year for UNITEC, which has innovated over the past 12 months and continues to innovate continuously. In fact, UNITEC strongly believes that continuous innovation is the only way to provide concrete and high-performing responses to each client's needs worldwide. More company information: Unitec S.p.a.
A Fruit Logistica UNITEC presents its technological know-how and innovations.